I adore Tijan’s books, this author gave me Fallen Crest, a series that I still hold dear to my heart and re-read often. I lived vicariously through those characters and still do. Bad Boy Brody is more for us die hard adult romantics, a movie star hero and a woman who is one with nature, a far cry from the Hollywood stars this movie star is more accustomed too. But, as the age old saying goes, opposites attract. I lived this book, I couldn’t put it down and I fell in love with these characters. While our heroine may be misunderstood by most and may stretch most people’s imaginations, I just didn’t care. It’s fiction, it was a fantastic story and I loved it. Brody Asher is on the red carpet at his most recent premiere when he gets a call that leads him down a path of self-destruction, thus earning this golden boy his bad boy persona. His new manager though will not let him sink and finds him a new movie far away from Hollywood and its distractions. 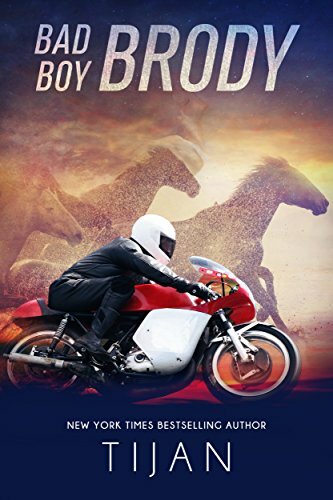 On the plains of Montana Bad Boy Brody is given a chance to redeem himself, but what no-one banked on was that it would take a woman to do it. Morgan was once a part of a family that had the world at their feet. A family who loved one and other and enough money to make them comfortable for the rest of their lives. However, greed is an ugly thing and when the past comes back, it comes with tragedy. Morgan flees to the one place she feels safe…living in the plains with a herd of wild mustangs. Morgan was like a mother nature, she lived off the land and her only companions were of the four-legged variety. She had tamed the untameable and the horses were as much a part of her as she was to them. Morgan was wild and free, a free spirit, but the spirits of the past were never far from her thoughts. She was the untamed one. Brody is the lead actor in a film about Morgan’s mother and filming on their land is how Brody and Morgan first meet. Their souls called out to one and other as if knowing that only they could fix one and other. I loved how visceral Tijan made this book, I felt the wind rushing as I pranced about on a wild horse and lived the life of Morgan. The emotional connection between Brody and Morgan was spot on and I was championing these two along from the very beginning. This was a slow burn, I adored those tentative first meets, the fight or flight instinct that was ever present. It added fragility, it added truth and honesty. Brody had to tame her, gain her trust, just like Morgan did the mustangs. The suspense element was unexpected but added value to a story that was unputdownable from start to finish. My only niggle was that it did drag in places, but to be honest, I didn’t really care. I loved spending time with this couple and didn’t want to leave them behind. I must admit, I would have loved an extended epilogue. I just felt that considering the changes that were made (vague so as not to spoil it) it would have been great to get a glimpse of them in the future. For me though, I loved it.